George Woolhouse (3½) beat Peter Wilson (4) +7. A neutral venue was preferred due to the distances required to travel. Nottingham helpfully provided personnel to open up. Play commenced on lawns 2 and 3 but had to be delayed when it was noticed that William Gee was playing on lawn 1. Under the revised Nottingham protocol, a risk assessment was undertaken and play was transferred to lawns 4 and 5 to avoid injury. 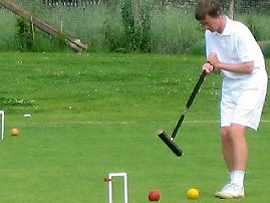 The only other notable event in the morning’s play was that the doubles finished before the singles. The afternoon was a tense affair with only Woolnough showing some solid play to leave Colchester 3-1 up. However, the other 3 matches could have gone either way and it was with some relief that Woolhouse held his nerve to seal the match. Thanks again to the Nottingham contingent for hosting us. Played as 18 point games in beautiful weather except for a brief period of heavy rain, which affected one round of play. Flexible Swiss format. Winning 5 games out of 5 gave Justin Brightmore (Bury), the winnewrs trophy. His handicap was reduced from 18 to 12. Runner-up was Abdul Ahmad (Pendle & Craven) with 4 wins out of 5. 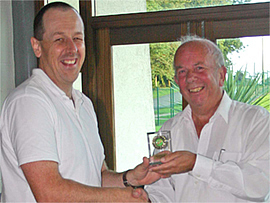 This one day Advanced event was played in beautiful summery sunshine, XYZ format, Ian Lines (Bowdon) dissecting all opponents with his usual surgical precision, winning the tournament by completing a triple peel in winning each of his 4 games, with Dave Nick runner-up.